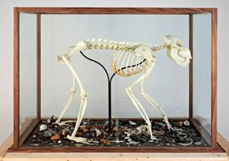 Mark Dion, Mandrillus Sphinx, 2012 – Private Collection, Paris – photo © Jean Vong, Courtesy artist & Tanya Bonakdar Gallery, NY. 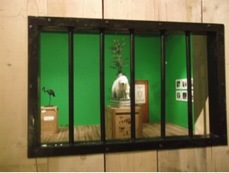 Some of Mark Dion’s wondrous collections look like humoristic ‘Wunderkammer’, others like three dimensional nightmares. ‘Our way of living is suicidal,’ conveys the American artist at the opening of The Macabre Treasure in The Netherlands. 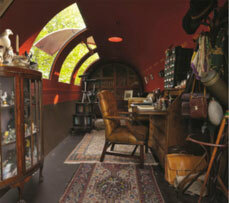 Things showed him the way to the museum world and a career as an artist. Coming from a working class family, Dion was not familiar with museums. But his first excursion to the local natural history museum with school, with its display of artefacts about whaling, was love at first sight. Dion clarifies this by showing me his photos of the representations of the polar bear, which he took in 22 museums around the world. ‘In the nineteenth century, the polar bear was presented as a fearful monster with sharp claws. Nowadays as a vulnerable creature that needs to be protected’ [iii], Dion declares. A dramatic shift of power in the relation between man and animal, which he underpins with his own version of the polar bear: a stuffed animal standing in a tub, his white pelt stained with tar, the sticky black residue of oil. Collecting is a way to ‘grasp’ the world, physically and mentally, to gain knowledge through things. When 17th century adventurers and merchants sailed the oceans, they returned with shiploads of plants, animals and artefacts, which were displayed in ‘Cabinets of Curiosities’. These represented the world in a nutshell, embodying the abundance of God’s creation. Collecting starts with comparing, looking for similarities and connections, but ordering and classification systems are always based on value systems. Dion playfully questions the dominant ‘objective’ scientific taxonomies by reminding us that there are other ways of ordering. Just have a look at the world through the eyes of an amateur (or an artist). Subjective but committed. Dion’s activist approach fit the holistic concept of curator Carolyn Bakargiev, who invited him to take part in dOCUMENTA 13. In Kassel, the artist paid tribute to Carl Schildbach, who spent 18 years of his life, from 1771 to 1799, gathering the wood, leaves and seeds from 441 trees in Kassel’s environment, to create the first encyclopaedia of trees. Dion encased Schildbach’s famous ‘Xylotheque’, or wood library, in a beautiful cupboard, decorated with inlaid tree illustrations. Such as the oak tree, that refers to the gift of 7000 oaks of Joseph Beuys to Kassel in 1982. Dions Society of Amateur Ornithologists – on show again this summer in EMSCHERKUNST 2013 – is dedicated to ornithologists and their love of birds. A hopeful sign in the Ruhr district, once the most polluted industrial region of Germany, which is now being ecologically revitalised. In the process, the Emscher, which functioned as a canalised open sewer, will be turned into a river again. In Seattle, Dion realised a large permanent installation at the Olympic Sculpture Park. At first sight, his Neukom Vivarium (2004-2006) looks like a giant nursery. A dead tree from the nearby nature reserve lies in a glasshouse, horizontally, like a dead body in the morgue. Controlled lighting and humidity levels should bring the tree to life again. Visitors are invited to use magnifying glasses to inspect the log for sprouting seeds, living insects, and bacteria. But judge yourself. Our technology is too limited, it can never replace the incredibly complex bio system of nature itself. Dion has no solutions. He holds his art up as a mirror to us, and expresses his mourning. His show in The Netherlands has the meaningful title ‘The Macabre Treasury’, showcasing a Mandrillus Sphinx – a species that is threatened with extinction – reduced to a skeleton, paving his way over golden treasures. And for those who follow the ‘Snowroute’ in the vast Norwegian mountains, Dion prepared another surprise with his installation Den (2012). When you enter a cave like building of architect Lars J. Berge, you find a bear sleeping above a mound of refuse of human civilization, which even here, in the vast wilderness, with its gorgeous vistas over glaciers and fjords, you cannot escape.